2016 VetShopAustralia Win a SUP Board Winner Announced! As part of the Advantix 6 + 1 promotion, we are very excited to announce and pass on our congratulations to Geoff Muldoon from Newcastle, the winner of VetShopAustralia’s 2016 Win a SUP for You and Your PUP competition! We would like to give a BIG thank you to everyone who entered the competition. The competition was a precursor for the 2016 Surfing Dog Spectacular, which was the biggest and best yet! 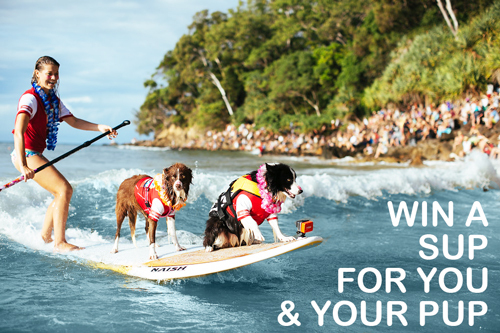 If you'd like to see more of the action from the 2016 Surfing Dog Spectacular head on over to the VetShopAustralia website or our Facebook page. Official Surfing Dog Spectacular Footage Release! The Noosa Surfing Dogs are even popular in Spain! The Noosa Surfing Dogs Make The Guardian!